Ironically, I will start this post about a smoothie recipe by telling you that you don’t really need a recipe for a smoothie. I’m no smoothie expert, but I can’t say that I have ever followed “directions” or a “recipe” for one. I quite literally place some ingredients into a blender, blend, and taste. Then I add according to what it needs more of — sweet, chocolate, liquid. That said, I think there are ingredients that we may not have thought about adding to smoothies or tips about how to incorporate more protein or fat into one that we can discuss. But in general, I think the flavor and consistency of smoothies is a personal thing. I like mine pretty thick and my son likes his thin. I don’t like overly sweet smoothies, but I do like a little bit of texture or grainy-ness. I don’t mind a horrible color (like when you blend spinach and mango and blueberries), but my kids are usually repulsed. And so on. This smoothie is one my students encouraged me to post because it’s delicious, seasonal, contains a very unusual ingredient and they wanted the proportion of spices that I used. If ever I were to post a recipe for a smoothie, this would be a good candidate. Everything is coming up pumpkin right now, whether you are scrolling through your social media feed or perusing the aisles at Trader Joe’s. I actually asked the cashier at Trader Joe’s if there was anything they hadn’t converted into a pumpkin flavor. But it’s all seasonal. After Thanksgiving, pumpkin-flavored anything becomes persona non grata. Which I find silly. I don’t see why that should be the case if you enjoy the flavor of pumpkin and the traditional accompanying spices. We all know pumpkin puree is available all year long. Smoothies are something I do not make all year long, though. Smoothies are typically cold and cold foods are not great for digestion, especially first thing in the morning. In addition, if the weather is cool, smoothies are also not great for you since cold foods cool you down. However, if you’ve been reading my blog at all for the last 6 weeks, you know that we have been suffering through an EPIC heatwave. I pretty much want to eat smoothies for breakfast, lunch and dinner. And sometimes we do. And since there seems to be no end to this heat, I will be making smoothies, pumpkin or otherwise, indefinitely. 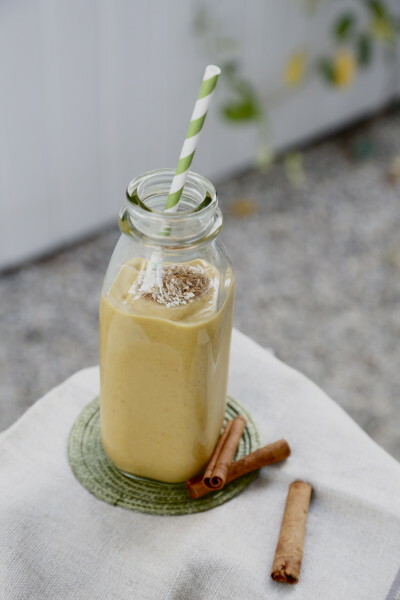 This pumpkin pie smoothie has become a favorite. I actually feel like I am consuming a pumpkin pie milkshake. It’s creamy and lightly sweet and feels quite indulgent, but it is downright good for you! Pumpkin is so rich in caretenoids, fiber, Vitamin C and can help to lower blood pressure. 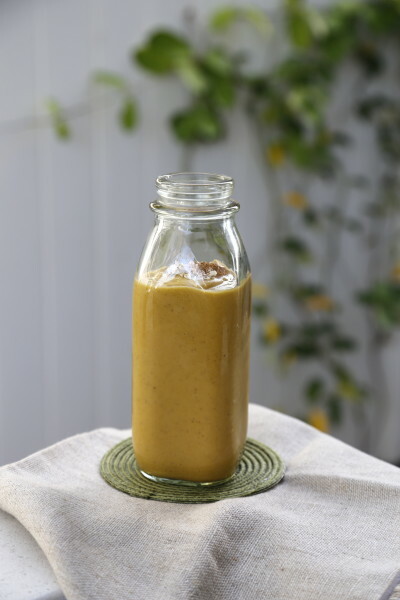 Pumpkin puree is perfect for a smoothie because it’s so creamy, but on its own is not really that sweet. 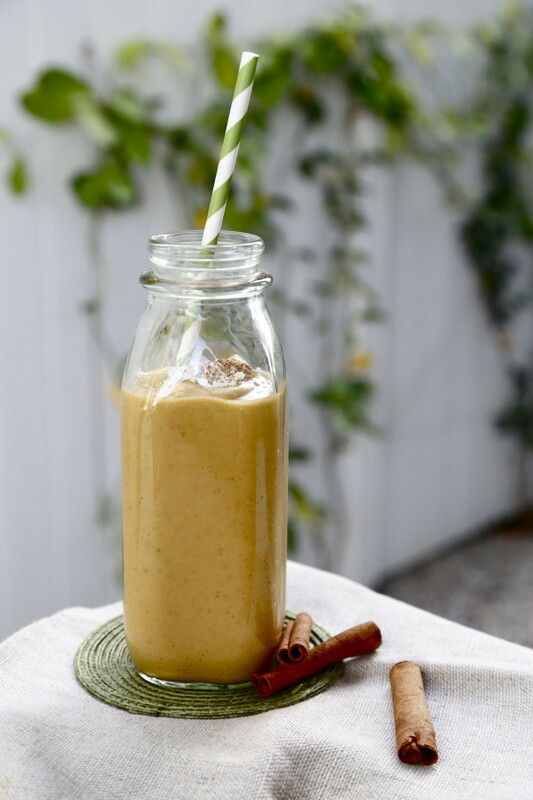 So besides adding classic pumpkin pie spices, a pumpkin pie smoothie needs some sort of sweetness. 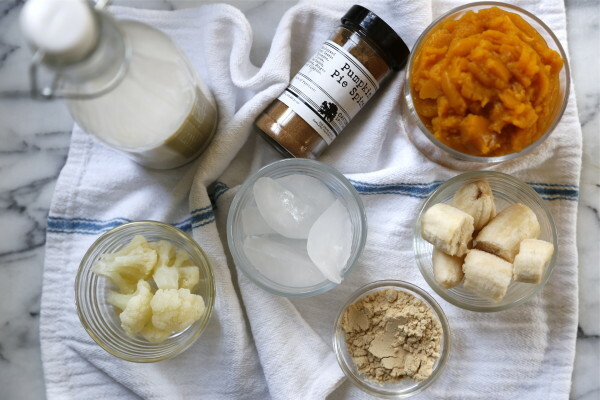 You can use whatever you want – stevia, honey, maple syrup, maple sugar, lucuma powder, sweetened protein powder, pitted dates, or frozen banana. All of these are great options. But the one thing I find tricky is adding bulk to a smoothie without having to add fruit. Fruit is terrific and it’s a whole food, but it is still a relatively high glycemic food. High glycemic foods raise your blood sugar and encourage your body to release insulin, a pro-inflammatory, fat-storage hormone. So yes, fruit is a healthy food, but there is such a thing as too much fruit, especially if there’s not much else in the way of fat and/or fiber to balance it out. So when I saw my friends at CJ Nutrition add cooked, cold cauliflower to their smoothies, my eyes bugged out of my head. Genius. Lots of bland, creamy nutrition to add substance without sweetness. Adding vegetables to smoothies is nothing new, by the way. Spinach and kale are old hat. So why should cooked cauliflower be looked at with skepticism? I tell you, it’s a game changer and cold, cooked cauliflower is the secret ingredient in my pumpkin pie smoothie! Next, protein is always a priority if a smoothie is to be a meal replacement. I very often look to nut butters like raw cashew butter or almond butter, hemp or chia seeds, raw walnuts, cashews or pecans, yogurt, hemp milk, or protein powder. Protein powder is either sweetened or unsweetened. Either way, that will factor into the other ingredients you add. I sometimes add ice to cut the sweetness of sweetened protein powder. Lastly, there are also a few ingredients that I might throw in for the heck of it such as cold, leftover oatmeal which makes a nice thick, creamy smoothie. Or coconut butter — gives a lovely sweet flavor and some extra calories for those very active kiddos that need it. And superfood powders like maca, lucuma, reishi, chlorella and the like. I usually use 1 teaspoon of any one of those, but keep in mind chlorella is bright green. The point is that there are infinite ways to tweak this smoothie or any smoothie. But if you don’t feel like messing around and you want a sure winner, look no further than the bottom of this page! 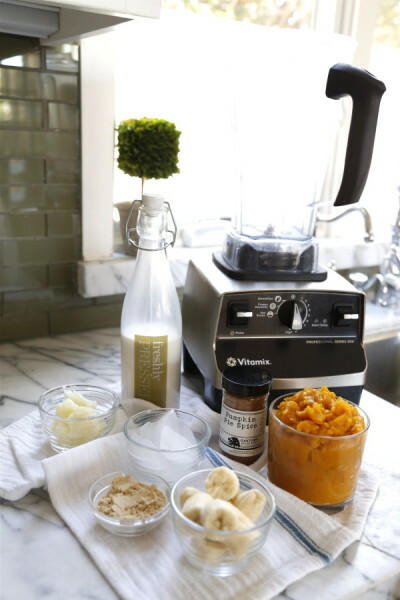 Blend all ingredients in a blender until smooth and creamy. Taste for sweetness and consistency and adjust if desired. Enjoy as is or top with a dusting of ground cinnamon and shredded, unsweetened coconut. I am crazy about Oaktown Spice Pumpkin Pie Spice right now, but you can make your own blend combining cinnamon, ginger, nutmeg and cloves. Cardamom is nice, too. There is a big difference between glycemic index (how much sugar food contains) & glycemic LOAD (how much of the sugar your body absorbs & how fast). Food with HIGH glycemic LOAD cause a short sharp peak in blood sugar, because your body breaks it down easily = sugar high then crash (refined white bread/ pasta, high fructose corn syrup). Foods with LOW glycemic LOAD have a slow and low peak, because your body breaks it down more slowly = long lasting energy (fresh fruit & veggies). Although fruit & veggies such as carrots have a high glycemic index, they do not have a high glycemic LOAD. Therefore, your body does not absorb as much of the sugar or as quickly. In general, the more you process food, the more the glycemic load increases, among other negative effects. You are quite right, Cristina, and well said. I should not have been so casual writing about the glycemic index, when in fact the glycemic load tells the whole story. But I think my intended message is still the same which is that we should be careful about not overdoing fruit and especially fruit juices in one sitting. The calories from super sweet fruit add up fast, beyond just looking at the total fructose. The calorie counts of many smoothies can top 600 calories which I think would surprise people. Goin g back to the glycemic load, some fruits have a lower glycemic load than others. Ripe bananas, for example, which are in so many smoothie recipes, have a glycemic load of 16 which is considered to be “medium-high.” Dates have a “high” glycemic load. But green apples are low. Thank you for contributing to this discussion! Your note about adding cauliflower is fantastic! I bet cooked butternut squash would be excellent as well. Actually, the possibilities with cooked veggies (as opposed to always adding fruits)are numerous. Thanks again for another valuable post! Lois, cooked butternut squash would be lovely here and I think it can even sub for pumpkin puree. In fact, leftover roasted sweet potato would be great in this smoothie! Awesome! I love your explanation of what and how and why. Will try this out today!